PHOTO/CHRISWRAIGHT Region – Shrewsbury High School's Julia Mastrototaro (#5, left) battles Algonquin Regional High School's Cassandra Chaves (#14, right) for the puck. 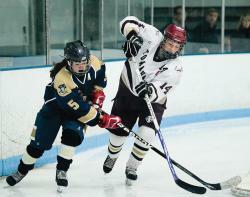 Region – Shrewsbury High School's Julia Mastrototaro (#5, left) battles Algonquin Regional High School's Cassandra Chaves (#14, right) for the puck. The Shrewsbury Colonials girls ice hockey hosted the Algonquin Tomahawks at the Charles J. Buffone arena in Worcester Feb. 12. The Colonials scored first and led, 3-2, well into the third period. However, a goal by Andrea Fahey and then by Elizabeth Holmes put the Tomahawks up for good for a 4-3 victory. Kelly Wendt and Maddie Evangelous also scored for the Tomahawks, who go to 10-5, 5-2 Eastern Massachusetts Girls Hockey League (EMGHL).